How to design a new government? America's key adviser on a new Iraqi constitution has said that the United States should accept the country becoming an Islamic democracy. Noah Feldman, a law professor from New York University, will be advising the future Iraqi interim authority on how to design a new constitution. He will be working for retired US general Jay Garner - Iraq's interim leader - in the Office of Reconstruction and Humanitarian Assistance. He told BBC News Online that in his view the US should support democracy in Iraq even if it was a not a secular democracy. Speaking in Washington before departing for the region, he argued that the separation of church and state, although a central part of the US constitution, might not be appropriate for a country which was overwhelmingly Muslim. And he said that he believed the US Government was broadly united on this goal, citing comments by White House spokesman Ari Fleischer, who cited Turkey's Islamic democracy as a good model for the region. Mr Feldman made it clear that it would be up the Iraqis to draft the new constitution, adding that the two biggest issues would be the separation of church and state and the role of federalism. The Kurds in particular, who already live in a semi-autonomous region, are expected to press for regional self-government. But Shia demonstrations against the US presence in Iraq have alarmed some in the administration. 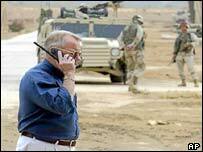 Defence Secretary Donald Rumsfeld has warned Iran not to interfere in the internal affairs of Iraq, and Democratic Senator Joe Lieberman said that the US would not accept rule by a theocracy. Mr Feldman said it might be necessary to have laws preventing foreign funding of elections. And he argued that introducing a liberal democracy would have to mean more than just having free elections, but would also have to include basic freedoms like religious freedom. He said that it would also have to include other freedoms such as freedom of speech and full civil equality between men and women. It would have to be based on the rule of law with independent courts and regularly scheduled elections, he added. Mr Feldman, who is a scholar of Islam as well as constitutional law, said there were many statements in the Koran that supported democracy and consultation. And he pointed out that it was not inevitable that the Iraqi people would prefer an Islamic democracy to a secular one. He also acknowledged that the transition process was bound to be fragile and could take a long time, as institutions were created from scratch. But he added that if the US was to accomplish its objectives - and demonstrate that it came to bring freedom to the Iraqi people - it was vital that the process be allowed to play itself out.